Each metric gives you information. In theory, you can measure each aspect of your business, but in practice you need to choose what to monitor and why. But how can you identify the most crucial metrics that enable your business to grow as you expect? What areas should be monitored? These questions are also valid for field operations, in the context of which we can ask how field service KPIs can be optimized. Before you learn the most crucial KPIs for field service management, it should be mentioned that the selected areas of performance measuring are divided by role. In fact, all people in your organization and their efficiency impact the KPIs. But, in a service organization, you also need to take into account that some unforeseen circumstances may arise, such as vehicle breakdowns, canceled appointments and employee sick leave. It is always worth considering this when carrying out the analysis. So, what key performance indicators in field service should you monitor to optimize the service process? Ratio of engineers to schedulers – this KPI is the best method to determine the planner/scheduler workload. It is a metric generally used for maintenance planning actions. For example if this KPI amounts to 50:1, it shows that 50 technicians’ tasks can be planned by one experienced scheduler in a stable, non-reactive environment. 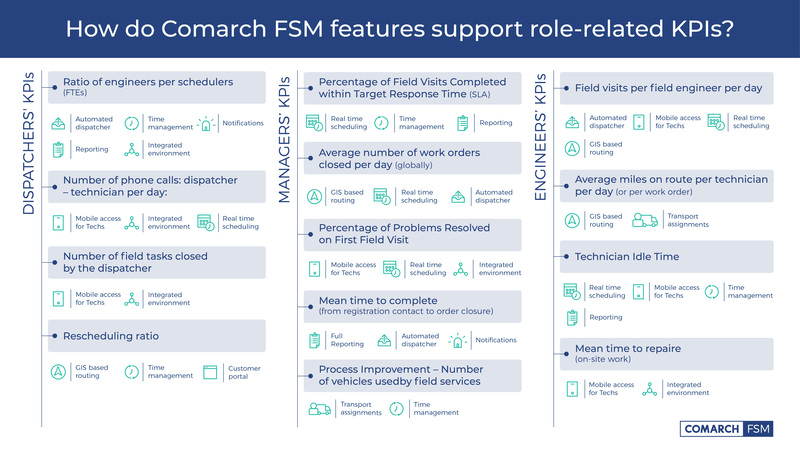 Number of field service tasks closed by dispatcher – even if the tasks are scheduled for each day, it doesn’t mean they will be completed – and it’s completed work that provides the measure of dispatchers’ daily effectiveness. It shows how many tasks may be completed per day by a dispatcher, even if the schedule is changed, and indicates the ability of dispatchers to manage ad hoc schedule changes. Average number of phone calls between dispatcher and technician – by counting the average number of calls between dispatchers and technicians, you can define how much time is lost due to additional communication, and how this extends service completion. Rescheduling ratio – the number of rescheduled tasks divided by all tasks indicates how much reactive work is needed, and potential financial losses arising from lost working hours or lost customers as a result of these changes. Percentage of field service visits completed within an SLA – indicates how many field service visits are completed within the target response time. There will always be unforeseen circumstances, so achieving 100% here is impossible – but 90% is within reach. Of course, it depends on the industry and the manner of workforce management. Average number of work orders closed per day – by monitoring the average number of service visits per day and optimizing it, for example from five to six, definitely changes the overall service business operations. Having even 100 people working in the field means 100 more tasks can be completed per day. This would also impact SLA coherence and client satisfaction. Percentage of problems resolved on first visit – by measuring the first visit success rate, a company can optimize productivity and profitability of a service business and improve its customer retention rate. By constant improvement of this KPI, the business is less exposed to potential lost time and resources for one issue resolution. It is crucial to note that this rate depends on frequent technician training, an informed back office and real-time information updates. Mean time to complete – if the company decreases average time to complete an issue from incident reporting to resolution, it has the opportunity to complete more orders per day. To support this KPI, you need to consider all the areas that may speed up processes. These include the optimal route to each client’s premises, and effective communication of important information between dispatchers and technicians. Number of vehicles used by field services – together with each work order assignment, you need to consider the vehicles needed to get to each client’s location. When your company is able to optimize some processes, for example limiting unnecessary visits or rescheduling automatically, the result is visible not only in the lower number of employees required, but also in terms of fewer vehicles needed and decreased fuel costs. Field visits per field engineer per day – by monitoring the number of field service workers’ visits per day, your company identifies the most productive workers and not necessarily the most engaged technicians. This KPI for field service workers can provide valuable information for managers, especially when they need to decide about promotions, bonuses or changes in the team. Also, when field workers know the standard number of visits, they are more motivated to reach this goal at the end of each day. Average miles traveled per technician per day (or per work order) – well-planned visits should be optimized in terms of the distance to and between each client’s premises. The situation becomes more complicated when changes in technicians’ schedules occur. A great deal of information needs to be processed to assign a worker near the customer’s location while avoiding unnecessary costs. However, if this is feasible it can lead to significant savings in fuel costs per month or year. Technician idle time – idle time does not mean that technicians are standing around willfully doing nothing. It is the time spent at base, and cannot be charged out to the customer. Typically, this could be time spent locating keys or vehicles, waiting for parts, and other such issues. The monetary value of idle time can be calculated by simply subtracting the hours worked from the hours attended. When you factor in the labor cost per hour, you can see how many lost hours your company pays for. Mean time to repair – this is the time needed to repair a given component or device. With this information, you can plan service visits more effectively. The factors that generally speed up issue resolution include employees’ knowledge of how to manage work orders, the necessary parts, and the quality of information provided by dispatchers. With all the listed KPIs for field service constantly monitored, the service process delivery may be mastered at various levels. Identifying the metrics that have the greatest negative impact on service performance is the first step towards implement organizational and technical changes. Each improvement should be compared with the previous results, to ensure that the company is going in the right direction. In Comarch, for example, we defined system features enabling specific KPIs to be mastered. It is also feasible to do the same for organizational procedures. With similar information, company management is aware of the micro-metrics that impact the presented macro-metrics, and may seek even small areas for improvement. For these reasons, metrics should be used in organization.